There’s something rotten at the headquarters of S.H.I.E.L.D., and it’s up to Captain America to find it and save the world! Seriously, if I told you more, it would give away too much. Captain America: The Winter Soldier is the latest visit to Marvel’s cinematic universe. If there were concerns that the Marvel films were heading for disaster – or at least disappointment – The Winter Soldier delivers the most engaging Marvel film yet. Steve Rogers, or Captain America, is still having some trouble adjusting to the modern world. But he keeps busy, helping S.H.I.E.L.D. with rescue missions and other assignments. However, he discovers Nick Fury (Samuel L. Jackson) has an agenda that is being kept hidden from Rogers. Meanwhile, Rogers befriends, Sam Wilson (Anthony Mackie), an Iraq War veteran who helps other vets adjust to life after combat. And then all hell breaks loose. The film features double-crosses, hidden agendas, political intrigue, ghosts of the past, killer computers, and a clear message about the dangers of giving up freedom for the sake of security. Iron Man 2 aside, I have enjoyed the Marvel films. However, so many of them have been focused on origin stories. As amazing as The Avengers is, it is really 90 minutes of the characters fighting with each other and a climax featuring an alien invasion, which we knew about early in the film. The Winter Soldier, however, has more plot than the other Marvel films. I found myself being taken deeper into the story as each new plot point or twist was revealed. The plot has a 70s-conspiracy-movie vibe to it. This is still an action movie, and The Winter Soldier delivers. It features a fantastic car chase and multiple fight scenes. The opening scene, in which Captain America and Black Widow (Scarlett Johansson) infiltrate a ship overtaken by pirates, features some great sequences, and some great sound editing. My son and I found ourselves cringing at the sound of Captain America giving the bad guys a beat down. Great performances dominate the movie, with Chris Evans continuing his portrayal of a man living out of sync with the times, yet Steve Rogers never seems like an idiot. Evans acts like a man who is smart, but is still trying to absorb the changes around him. Samuel L. Jackson, who has appeared in nearly all of the Marvel films, gives his best performance as the head of S.H.I.E.L.D.. I have never been a fan of Fury in these films, but his character gets more to do in this film, and Jackson brings humaneness to Fury that I haven’t seen before. Anthony Mackie joins the cast, giving us a character I liked from the minute he meets Rogers. And I can’t ignore Robert Redford, an actor not known for just doing acting jobs for a paycheck. His portrayal of Alexander Pierce, Fury’s boss, is complex. Redford shows that he is still one of our greatest living actors, and it’s great to have him in a movie with this much political intrigue. The Winter Soldier was directed by Anthony and Joe Russo, whose credits include Arrested Development and Community. While there are moments of levity in the film, these two brothers keep the focus on the plot and amazing action scenes. I’ve only touched the surface of the story here and the twists the film takes. When one character’s identity was revealed, which, if you’ve read comics regularly, you already know, the gasps from audience members were sincere. The directors cleverly help the audience identify the character by dropping clues and then giving them a moment to digest the reveal. The comic book film has truly matured. 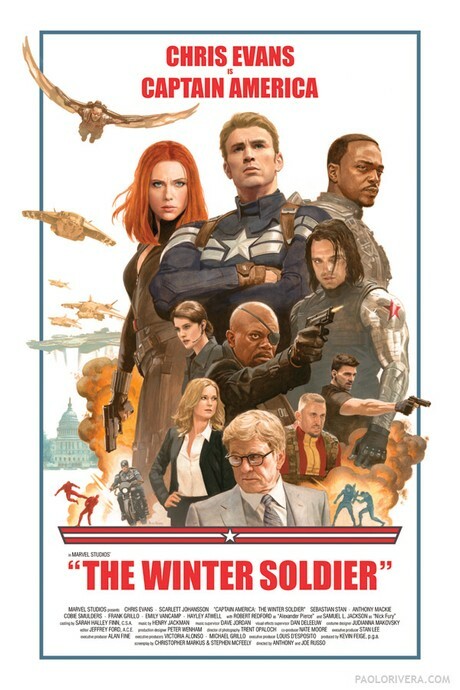 The Winter Soldier is outstanding entertainment with a great plot and some exciting scenes. If you’ve been watching these movies, sit through the credits – all of them – to find out where next year’s The Avengers: Age of Ultron is going to take us.